Bob-E is a new virtual reality (VR) robot designed and built by Ozeki specifically to provide free movement and head tracking. It will change the way you think about telecommunication and remote presence forever. Bob-E provides a truly immersive experience that allows you to take part in activities like never before. The original goal of building Bob-E was to allow our friends and colleagues to take part in activities from a remote location. The side effect was that we created a friend. Bob-E is more than a robot controlled by a human, he is a member of the community. No matter who controls it, he is fun to be with. He is always around, and he has an amazing personality. Once you take control of Bob-E, you will feel what it is like, when people smile at you, and how you will become a closer friend to those around you. You will learn and experience things you would not learn or experience if you were there as a human. The only thing you will miss, is that you were not there with us from the beginning of this project. While we built Bob-E we had the best times of our lives. When Bob-E was created, the software developers, the electrical engineers and the 3D designers were all teasing and pushing each other, and this activity provided a great number of opportunities for fun and inspired outstanding achievement. We are now more passionate about building robots, then we were ever before. We have learnt to work together amazingly well. 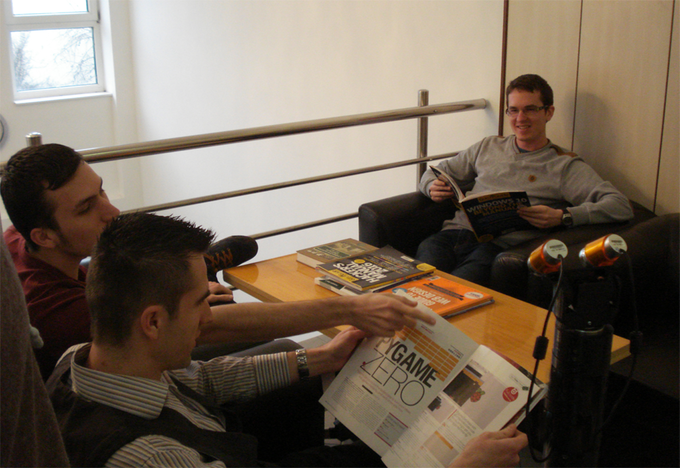 It would be great if you could join us for a day at our office and experience the atmosphere. 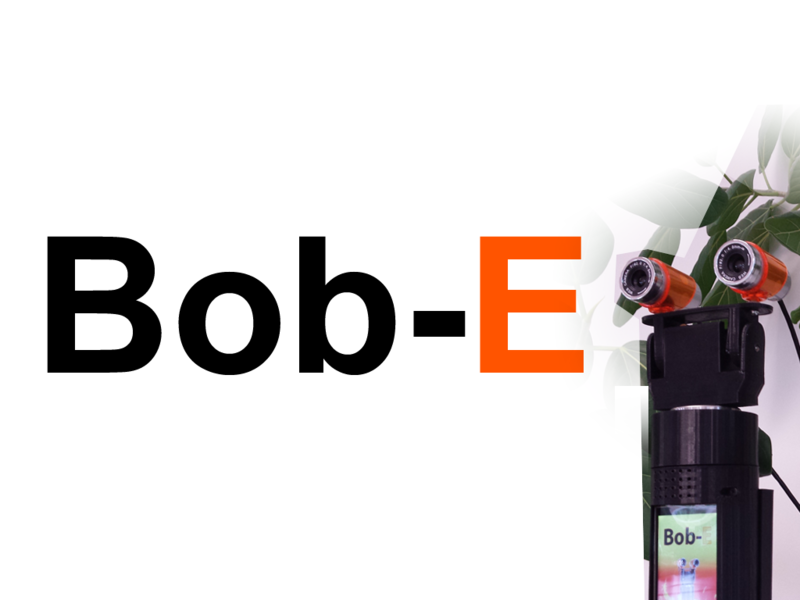 When you start to use Bob-E, you will be amazed at how easy it is to operate. 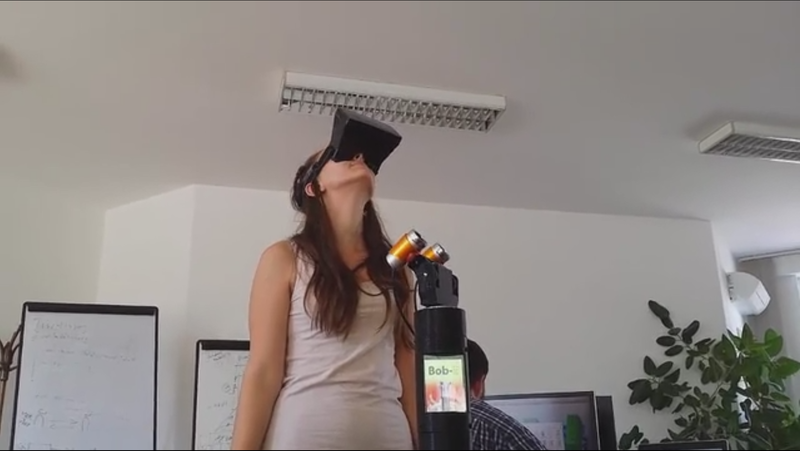 You simply have to put your smartphone (Android or iPhone) into the VR headset and turn your head to look around. You will also have a small bluetooth controller (a joystick) in your hands that allows you to move Bob-E around the room. When you turn your head, the cameras of Bob-E will track every movement synchronously in real time. 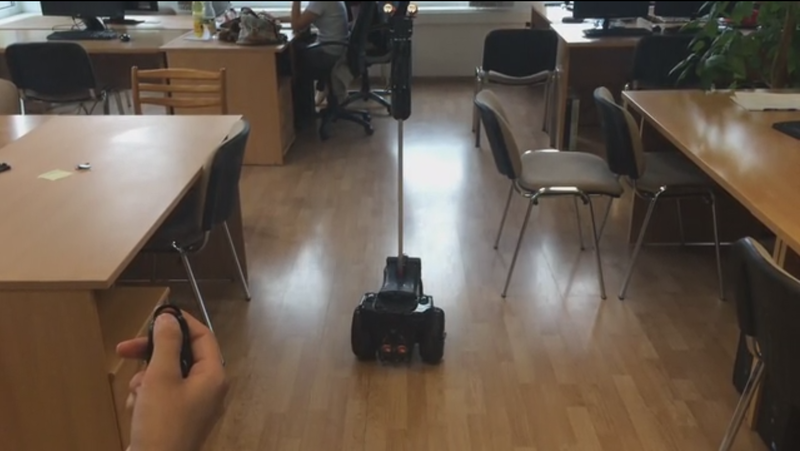 The robot offers fast, real time stereo 3D vision, that allows you to see what the robot sees just as if you were using your own eyes. The key feature of real time head tracking is possible, because Bob-E's cameras are super fast. The cameras follow your head movements at an amazing speed of 0.19 seconds / 60 degrees. If you think about it: it is less then a 1/5th of a second for an average head movement. We haven't heard about any other device that even comes close. The experience is also supported by Bob-E's physical design. 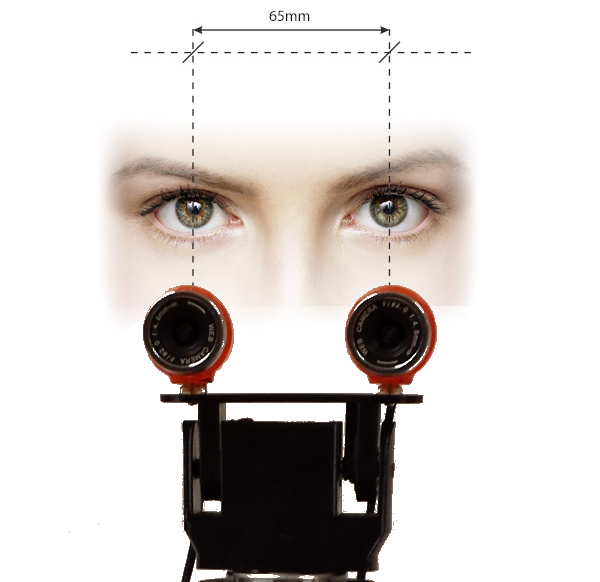 Bob-E's cameras are exactly 65mm apart, just like the human eyes. This provides a wonderful, realistic 3D vision when you look through the VR headset. It is a true 3D experience. When you get your hands on Bob-E you will see, that it's technology is state of the art. Bob-E's head movements are controlled by data collected from the motion sensors of the smartphone in the VR headset. These sensors track the head movement, and allow the software to instruct Bob-E through the network to turn his head. You will love that Bob-E can move around. 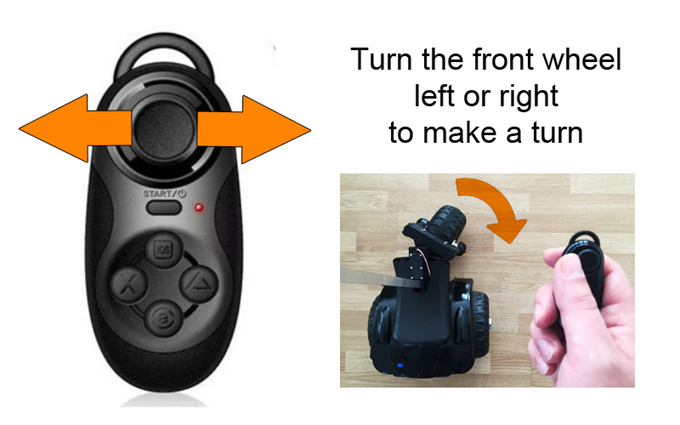 To instruct it to go forward, backward, or to turn, a small wireless controller (a joystick) can be used. 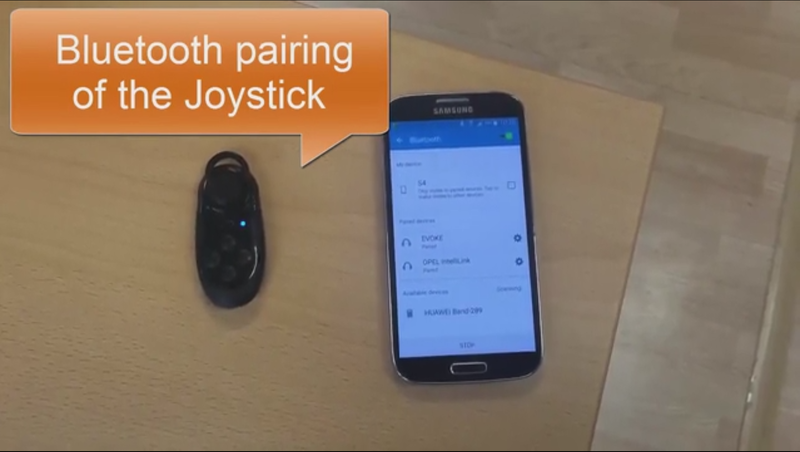 This controller talks with the mobile phone through Bluetooth. 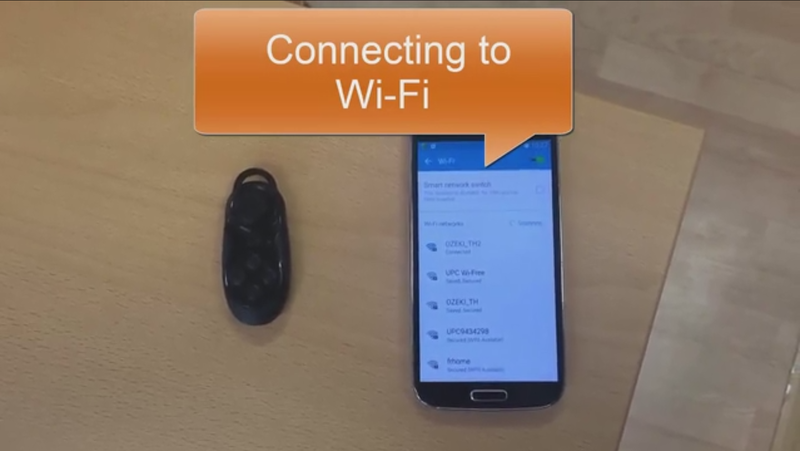 Wireless network: When you use Bob-E, you connect to it from your smartphone through Wi-Fi. 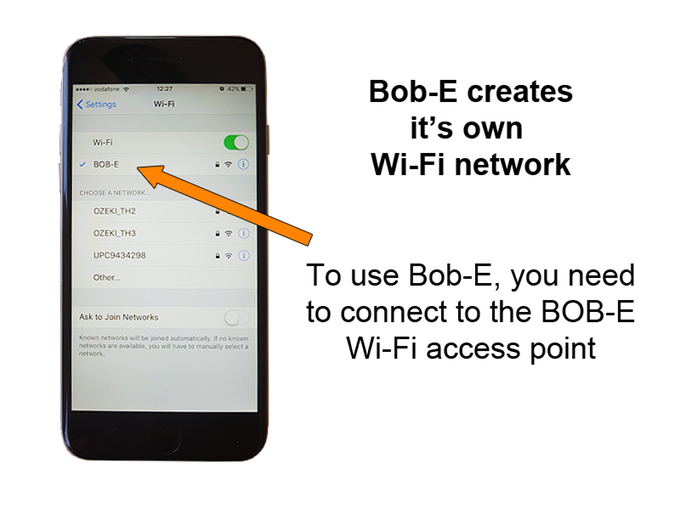 The default settings for Bob-E is to create it's own Wi-Fi network. Bob-E will show up as a network on your mobile device. You also have the option to use it in Wi-Fi client mode. For example it can connect to the mobile Internet connection shared by a mobile phone. Head tracking: Bob-E's head tracking uses the motion sensors of the mobile phone. These sensors can be accessed through the webbrowser, so no app needs to be installed. The following video shows how you can connect to the user interface of Bob-E and how you can turn on head tracking. Note that the first step of head tracking is called synchronization. 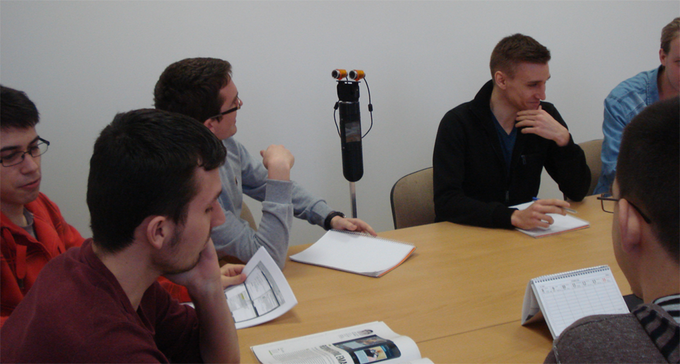 During this proces the initial orientation of the mobile phone is pushed to Bob-E, so the camera orientation can be set. The following video demonstrates two modes for turning the front wheel. You can use the GUI on the mobile phone to make high precision movements. You may use the joystick to make fast movements. 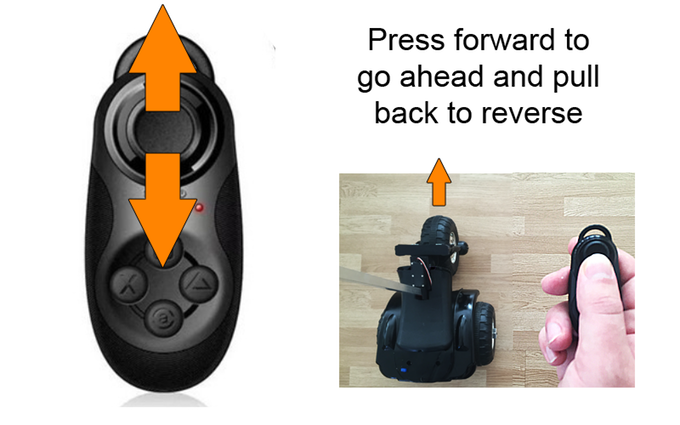 Notice that the webbrowser GUI captures the commands from the Bluetooth joystick, and highlights the corresponding arrows in blue, when a command from the joystick is received. To go forward or to reverse, both the graphical user interface and the joystick can be used. 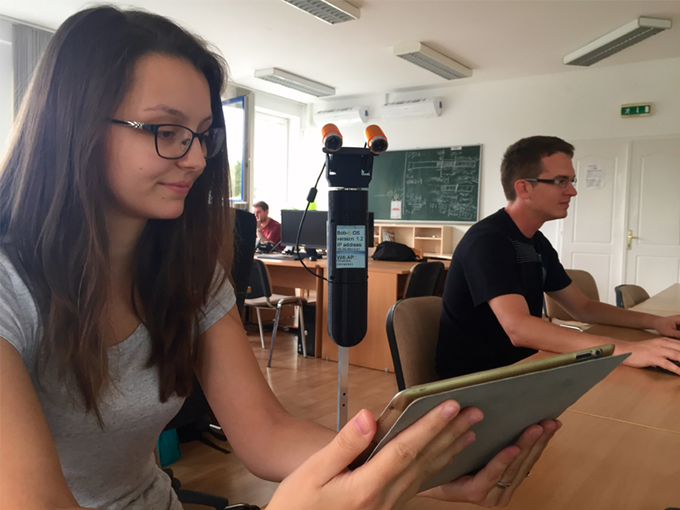 The graphical user interface can offer more precise, the joystick a more natural movement. Display: Bob-E's display can be used to display images. 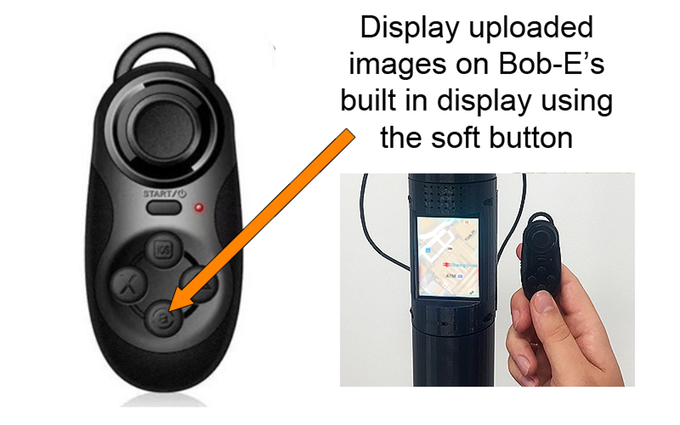 You may upload images to Bob-E using a webbrowser, and you may use the soft button on the joystick to switch between uploaded images. You may display a map, or a QR code at airport checkin, or any other visual information. One of the first thing you will notice, when you start to use Bob-E is, that he is the right height to look you in the eyes while you are sitting. This height is also optimal to read the documents on the desk. It is very funny when you control Bob-E and you turn your head and look at somebody after reading a page. 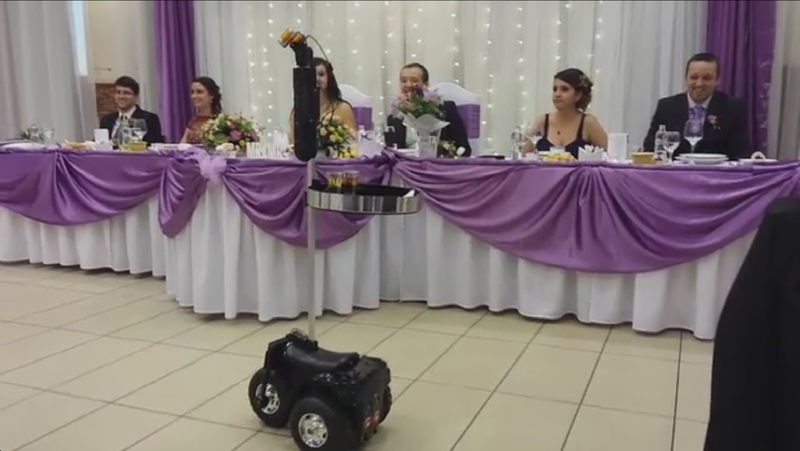 People don't expect the robot to be able to quickly turn it's head and look them in the eyes. It was very funny, when Bob-E did this on one of our meetings, Peter, one of the team member was so suprised, he fell of his chair when Bob-E turned to him. It caused great laughter. When you use Bob-E, you will also enjoy that after everybody get's used to the robot moving around, you can sneak behind somebody and watch his computer screen. Unless they are prepared, they will not notice. This will give you the opportunity to see what happens in the office, what people are working on. Another nice feature is that you can make comments very politely using body languague. You can use Bob-E's head to make gestures, such as the head nod up and down to say 'yes', and the head nod from side to side to say 'no'. Once Bob-E becomes part of the team, it is hard to imagine life without him. Bob-E is so much fun to have around, especially, it the person controlling it has a sense of humor. People interacting with Bob-E quickly treat him as a friend, because he is always interested in new ideas and listens carefully. If you are interested in technology, you might be interested to know that Bob-E is operated by a next generation operating system called Bob-E OS. This system was designed and implemented from scratch by our software developers. It took more than two years to build it. This operating system allows full hardware control, parallel sensor and actuator management, it provides audio and video support and has outstanding communication capabilities. This operating system manages Bob-E's motion and vision by controlling it's stereo 3D cameras. If you decide to purchase Bob-E, you will enjoy all the benefits it offers. 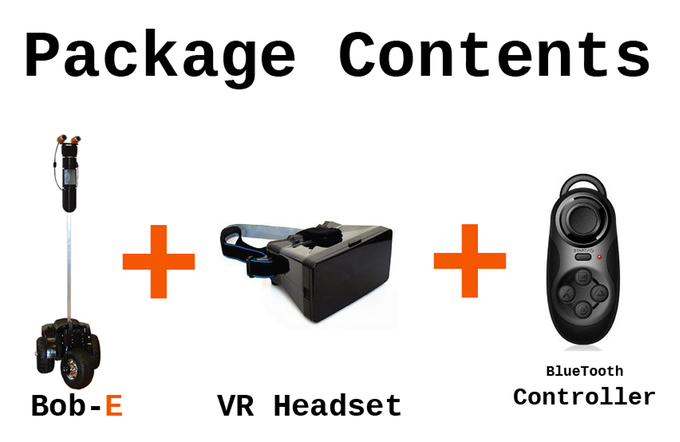 The complete package includes: Bob-E robot, a VR headset and a bluetooth controller. Please note, it does not include a mobile phone. You will have to put your own Android mobile or iPhone into the headset, but it supports every mobile with a webbrowser and a gyroscope. 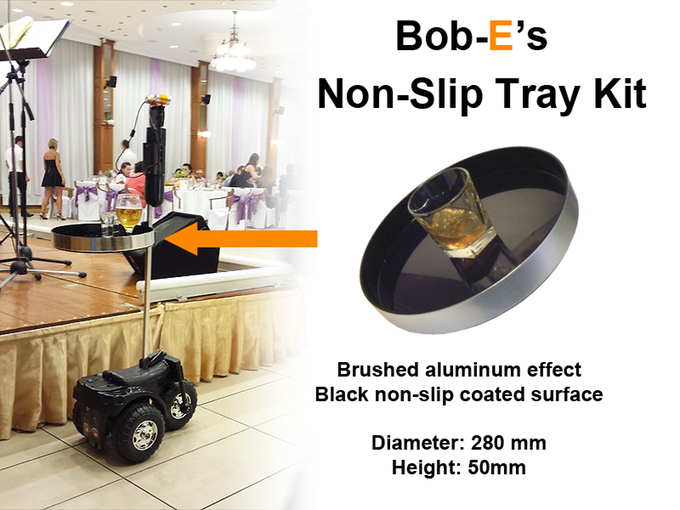 We will include a Non-Slip tray kit with all Bob-E Robots, because we are sure you would also like to carry drinks around with Bob-E. The Non-Slip tray kit consists of a round 290mm diameter x 50mm high non-slip tray, and a strong mounting kit that allows you to mount it on Bob-E. The tray has a brushed aluminium effect finish with a non-slip coated surface for greater ease of carrying & deep sides, designed with health & safety in mind, meaning that even at the busiest of times Bob-E can carry multiple drinks safely & securely. Can Bob-e handle rough terrain? Bob-E can go up slopes up to 10% in elevation, it cannot go on sandy beaches and tall grass fields. It cannot handle mud. What is the maximum battery life? One fully-charged battery will give Bob-E 30-120 minutes of continuous operation, obviously it is usage dependent. 70% of power is pulled by Bob-e's motors. Constant communication or human interaction will have very little impact on battery life! The battery can be easily replaced to extend operation time. Will there be an SDK (Software Development Kit available)? - We will provide a well documented API that exposes all the core functionality of the robot. 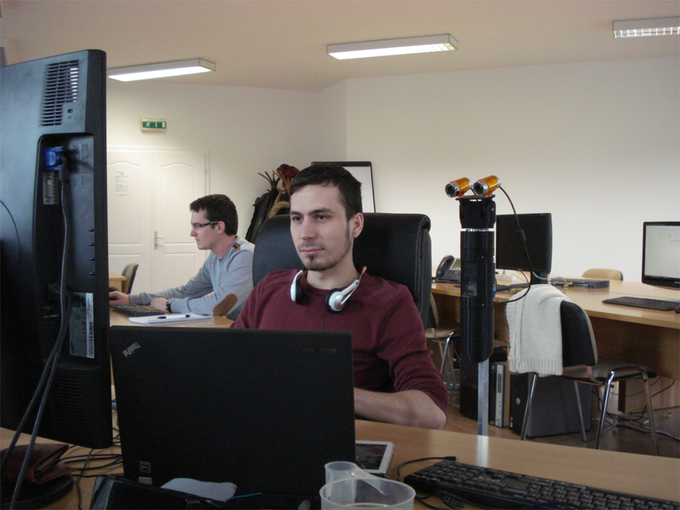 It is our intention to build a community of developers, so you can expect great software developer support. Can the camera resolution be upgraded? - Bob-E uses standard USB cameras. You can replace the cameras to higher resolution. You must note, that higher resolution cameras will require more processing power and bandwidth. This will have a bad effect on battery life and might cause problems on lower bandwidth (mobile Internet) connections. Can Bob-e carry extra load? - The Bob-E motors used for movement are equipped with a gear box, so they are quite powerful. 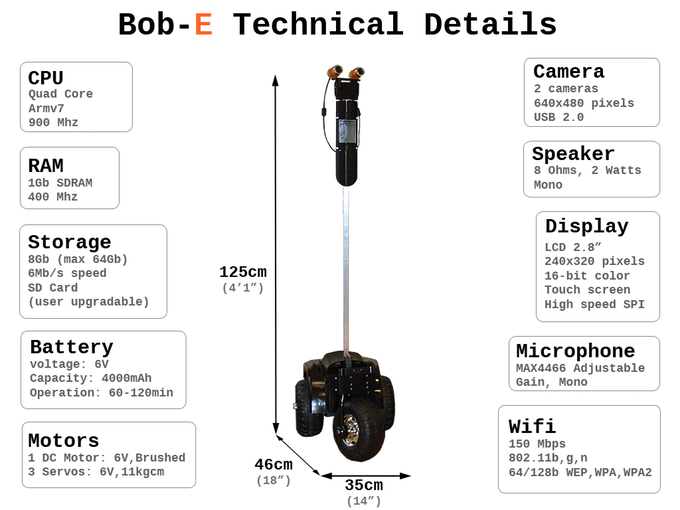 You can add an extra 5kg of weight to Bob-E without any issues.